The scrutiny was considerably less democratic than the brevia as it tended to be a secretive top-down selection process with the nominating body holding the decisive influence. Whoever managed to maneuver allies in this body was more likely to obtain representation and offices for his family and his friends. Once the candidates were selected, their names were placed in bags and at regular intervals a name would be drawn out at random for offices and positions that were rotated on a regular basis. No man would have a way of knowing whether his name had been added in the bag until he was selected, and this secrecy tended to tie an individual’s loyalties to the regime. Had the process been open, then factional tendencies within the ruling class, which often varied in size and composition throughout the period, would threaten to destabilize the regime. The scrutiny system’s origins lie in the 13th and 14th centuries, when Florence was plagued with factional conflict amongst the aristocracy who held to a code of honor that demanded that justice should be settled privately through vendetta rather than seeking redress through a third party. As neither side would recognize the legitimacy of the other’s claim, these disputes often degenerated into open warfare within the city. The city center became dominated by imposing fortress-like towers and palaces built by the leading Florentine families to be used as bases to wage their private wars against the other leading families. The recurrent outbreaks of violence between these aristocrats, which sometimes influenced events outside Florence, was a key factor in the emergence of the popolo as a political force. The popolo, which translated into German means Volk, referred to the citizens of Florence, who were not part of the elite but shared a collective identity and loyalty to the city as Florentines. In Florence, as elsewhere, the popolo were led by the major guilds, which were mass organizations with their own officers, internal laws, and militias. They could and did on several occasions take power in Florence. Leather borse (purses) containing names in a drawing for the Priorate of Florence in 1431. 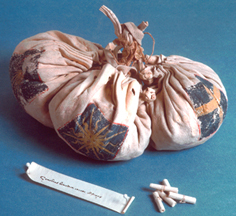 Below are five cedole (name slips) rolled up and tied as they would have been for a drawing. The first two popolo governments were established in wake of the destabilizing violence of the feuding aristocrats. The first popolo government, 1250-1260, was established to chart a neutral course in the wider political conflict between the Guelfs and Ghibellines, in which the aristocracy had embroiled the city, and to also take a stance against the aristocrats’ private wars by forcibly reducing the height of the aristocrats’ towers, thereby limiting their effectiveness in urban warfare. The second popolo in 1293 passed the Ordinances of Justice, a series of statutes subjecting a large group of the aristocracy to magnate status, which meant that they were barred from holding office. These popular governments were short-lived—the aristocracy eventually reasserting control—but they had the effect of forcing the remaining aristocrats to redefine their legitimacy and start co-operating with each other if they were to preserve elite rule. The scrutiny was developed as a solution to enable these factitious noble families and a select group of upper-class guildsman to share power. The nominating committees, under the control of the elites, would vote for noble families, and their names would be written on a ticket and entered into a bag known as a borse, which was locked into a chest. To prevent tampering, the chest was given to Franciscan friars at the church of St. Cross, and the key to it was held by Dominican friars at St. Maria Novella on the other side of the city. The restriction that no two members of the same family could serve on the same government body ensured that offices were not be dominated by one particular family or faction. Furthermore, the relatively small size of the candidate pool and the regular rotation of offices insured that each aristocratic family would not be long without office. To appreciate the regular rotation of this small elite, between 1329 and 1342, 302 citizens comprising 207 families shared the top executive offices known as the priorate. Almost three-fifths of these families held office more than once: 89 twice, 75 three times, 13 four times, and 1 five times. The second two popolo governments of 1343 to 1348 and 1378 to 1382 were more radical than the previous popular governments and aimed at expanding the size of the scrutiny’s candidate pool downwards to include the popolo, who came to power following a massive sovereign debt crisis. During the 14th century, Florence was engaged in expansionist wars to establish regional hegemony over Tuscany, and the elite ruling class, looking after their own interests, refused to implement direct taxation as to do so would impact upon their wealth. Instead military expenditures were dependent upon increasing consumption taxes and borrowing. For the popolo this meant increased prices for goods and forced loans whose low interest and intermittent repayments were little more than taxation by any other name. The aristocracy, on the other hand, enjoyed the privilege of making voluntary commercial loans at generous interest rates, which were guaranteed to be paid on time unlike the forced loans. These taxation and lending arrangements benefited the aristocracy at the expense of the popolo. In 1343 elite rule was overthrown and replaced by a third popolo government which destroyed the existing borses and instituted an expanded scrutiny to widen the candidate pool by reducing the number of votes a man needed to be selected for his name to be entered into the bag and replacing the aristocratic dominated nominating committee with one dominated by the popolo. The result was that between 1343 and 1348 the offices were filled with the ordinary citizens of Florence, who despite their plebeian background, were competent enough to deal with the sovereign debt crisis. They did what arguably any White Nationalist government should do with the contemporary sovereign debt crisis: they defaulted on the payments, suspended further interest, and refused to repay all but a fraction of the loan principle. The aristocracy took advantage of the political chaos caused by the Black Death as it swept through Italy in 1348 to undo the changes that had been made by the third popolo government. However, this was merely an interregnum before an even more radical popolo government between 1378 and 1382, which had come to power on the suffering caused by the popolo’s debt burden, both personal and government. Eligibility for the candidate pool was extended to all corners of Florence by the creation of new guilds to give all sections of the working class representation. It was not long, however, before the radical nature of fourth popolo government gave the wealthier guildsmen cold feet, and they switched allegiance again to the aristocracy, who offered them a share in government based upon a consensus ideology, in which the elite, no longer fighting amongst themselves, legitimized their claim to rule by presenting themselves as a unifying force ruling paternally in the best interests of the republic. The aristocracy altered the scrutiny system to ensure their dominance. From 1387 two borses were used: a large bag and a small bag, the borsellino, drawn from a smaller pool of the aristocrats who were given a quota of the available offices. Through this method, despite the apparent widening of the lottery pool, the aristocrats could secure the loyalty of the leading guildsmen by offering the prospect of office while the government remained dominated by 50 elite aristocratic families whose offices were regularly rotated. The new consensus regime went beyond the traditional role of government, which was to provide law and order and finance military expenditures. It would intervene in the social life of the Republic as well. The most pressing problem for the Florentines was that of population decline in the city as deaths began outstripping births. Beginning with the Black Death and continuing with recurrent outbreaks of plague, the city lost over half of its population. While there was little the Florentines could do about disease in the 15th century, they took measures to increase the birth rate in the city, first by providing positive incentives such as helping fathers provide dowries for their daughters through government-backed dowry accounts and by establishing a foundling hospital to care for abandoned children. Less successful were initiatives to combat homosexuality, which included shaming and fining homosexuals as well as the supervision of communal brothels to tempt them back into the heterosexual fold. These measures helped reverse the decline in population, and in the 16th century, the population began to increase again. 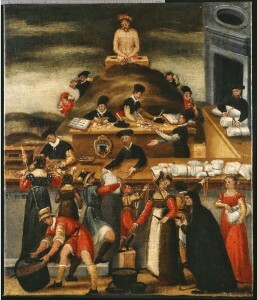 Also in 1495 the Consensus Regime founded the Monte di Pietà, a state bank to provide cheap credit to the poor in order to protect them from exploitation by Jewish moneylenders. The Consensus Regime of the aristocracy ruled successfully for a long period from the 1380s to the early 1420s. However, from the 1420s onwards, Florence was involved in a series of costly wars the larger share of which were funded through deficit financing. Power began to concentrate with those with the means to provide loans to the Republic. It was around this time that the Medici family, who held a vast banking empire, began to dominate the politics of the Republic. The Medici’s wealth dwarfed that of individual aristocratic families and enabled them to establish patronage networks on a much larger scale than could any individual aristocratic family. With Medici money flowing into the Republic, both formally through loans to stabilize Florence’s fiscal crises and informally through patronage, they became the de facto rulers of Florence through the existing political institutions. Between 1434 and 1494 the Medici wielded power indirectly, not through personally holding any offices, but using their wealth to essentially buy alliances with families who did. The Medici made moves, whenever the opportunity presented itself, to remove the unpredictability that sortition gave to the scrutiny through the borsellino, the small pouch previously reserved for aristocratic families to create tiny pools of handpicked men. If there were only 5 or 10 favorites in the borsellino, their names would eventually be drawn. The only thing that was unpredictable was when the individual would be drawn. This was clearly far easier to manipulate than a large pool where one could not realistically predict the outcome of the draw. The Medici government fell in 1494 due to external intervention from the French, leaving a political vacuum. Over a period of 5 years of debate and reforms, the Florentines drew up a new constitution which drew in elements of the existing scrutiny system and the brevia. Aping Venice, Florence created a consiglio in which membership was restricted to around 3,500 citizens who had an ancestor within the last 3 generations who had been selected for high office. This meant that both the aristocracy and the popolo would be represented. A nominating committee would be drawn by lot from the consiglio, with each member being allowed to nominate any individual he pleased. These nominations were then voted on by the council as a whole, and the group of candidates with the highest votes would have their names placed in the borse. In order to ensure the regular rotation of offices a lot would be held every 2 months to draw new names. This new constitution was designed to thwart any attempt by the Medicis to regain power through their allies, many of whom continued to reside in the city. The unpredictability of the nominating committee meant that it would be difficult for the Medici’s proxies to influence selections through patronage. In 1512 the Medicis returned to Florence at the head of a Spanish army organized by the pope, and they quickly dismantled the new constitution and restored the political institutions that existed before 1494 which they had manipulated so skilfully. It became increasingly clear that they were moving towards a new type of regime that would install them as hereditary rulers of the city. In 1527 the Florentines rebelled against the encroaching Medici tyranny and installed the last of the Florentine Republics reinstating the popular constitution of 1494. However, this was short-lived as the Medici recaptured the city in 1530 and consolidated their power over, establishing themselves as sovereigns, a position that they would hold for the next 200 years. Concentrations of wealth followed the concentrations of power, and while the Medicis became great patrons of the arts, the majority of the Florentines suffered from increasing poverty. The reign of Cosimo I from 1537 to 1574 is an example of Aristotle’s argument that giving power to one individual, while potentially greatly rewarding, is a great risk. Coming to power with little wealth, Cosimo I used his position to regularly divert public funds for his own personal purposes. He transformed the Monte di Pietà, originally established to combat the exploitation of the poor by Jewish moneylenders, and used it as a vehicle of Ducal patronage. The Jews who had been ordered out Florence by the last popular Florentine government were welcomed back and given license to continue their dubious business practices without official harassment. Adding insult to injury, foreign Jews from across Europe were permitted to settle across the territories of the Florentine Republic. The resulting impoverishment of the citizens is witnessed by the records of the number of abandoned children recorded by the states foundling hospitals: following consolidation of power by the Medici in the 1530s the number of children abandoned at the doors of the foundling hospitals almost trebled. John M. Najemy, A History of Florence, 1200-1575 (Oxford: Blackwell Publishing, 2006), 17. Alain de Benoist, The Problem of Democracy (London: Arktos Media, 2011), 44. Published: June 18, 2013 | This entry was posted in North American New Right and tagged articles, democracy, Florence, lot, North American New Right, originals, political philosophy, Simon Lote, sortition, the Jewish question, usury. Both comments and trackbacks are currently closed.